The pervasive health and wellness trend continues to influence dark chocolate market, with manufacturers incorporating organic ingredients and natural sweeteners. The preference for dark chocolate over milk chocolates on accounts its health benefits continues to remain intact. 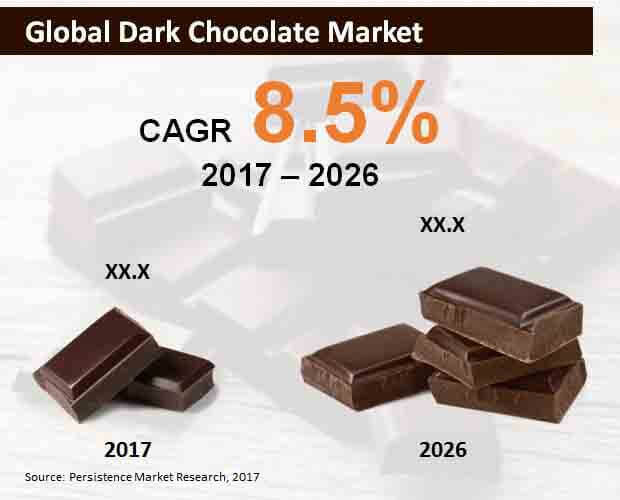 However, as the global chocolate industry is going through a perception crisis, with demand for healthy products witnessing an increase, it is highly likely that the dark chocolate industry may have to cop some of the downward spiral. The organic and clean label trend has swept industries across the broader food and beverage landscape. The influence of the organic and clean label trend is palpable among dark chocolate manufacturers as well, with demand for premium and organic ingredients witnessing a spike. Manufacturers are also focusing on incorporating natural sweeteners, such as stevia and coconut sugar to position their products to a consumer base that is highly conscious about the food choices they make. The pronounced focus on quality has meant that manufacturers are now focusing on including unique cocoa beans from Latin American countries. Although sourcing these premium ingredients from far off places increases the price of the end-product, growing demand for gourmet chocolate among consumers is paying off the dividend. As the global demand for dark chocolate continues to evolve, manufacturers are listening to the overt and covert needs and preferences of consumers. The focus has invariably shifted to incorporation of advanced packaging that conveys the brand message. As manufacturers are focusing on inducing a sense and perception of ‘healthy’ in their offerings, the packaging designs and materials have also witnessed changes. In addition to packaging, offering a range of flavored chocolates and ‘superfoods’ is another key prevailing trend. In the recent past, the demand for dried fruits, as well as blueberries and cranberries has witnessed steady growth in the manufacture of dark chocolate. It is likely that adoption of spices, flower petals, and acai berry in the manufacture of dark chocolate will witness steady growth in the future. Although fine flavor cocoa accounts for a single-digit share of the overall cocoa production, its demand has witnessed a spike in the recent past. This is primarily on account of growing popularity of specialty or premium chocolate among end-users. Demand for premium chocolate is particularly higher in North America and Western Europe. Although high-prices of these chocolates have meant that only a small percentage of consumers currently buy these premium products, the penetration is growing at a steady pace. This has led leading chocolate companies, such as Ferrero and Mars to invest in broadening their range of offerings. Ivory Coast and Ghana continue to maintain their position as the leading suppliers of cocoa beans to Europe and North America. These companies usually supply the Forastero variety of beans to manufacturers. In addition to these two countries, supply is also witnessing an increase from Liberia and Guinea. In addition to West Africa, supply of cocoa beans to international manufacturers is also growing from Latin American countries. Equador and Peru are among the leading exporters of cocoa beans to Europe and North America. The outlook on the global dark chocolate market remains positive for the assessment period 2017-2026. Catering to evolving consumer trends and complying with cocoa and chocolate certification will be key to maintaining and consolidating market position during the assessment period.